As I already mentioned in one of my last post, my 2015 started with RED. O yes, I am so much into Red these days. 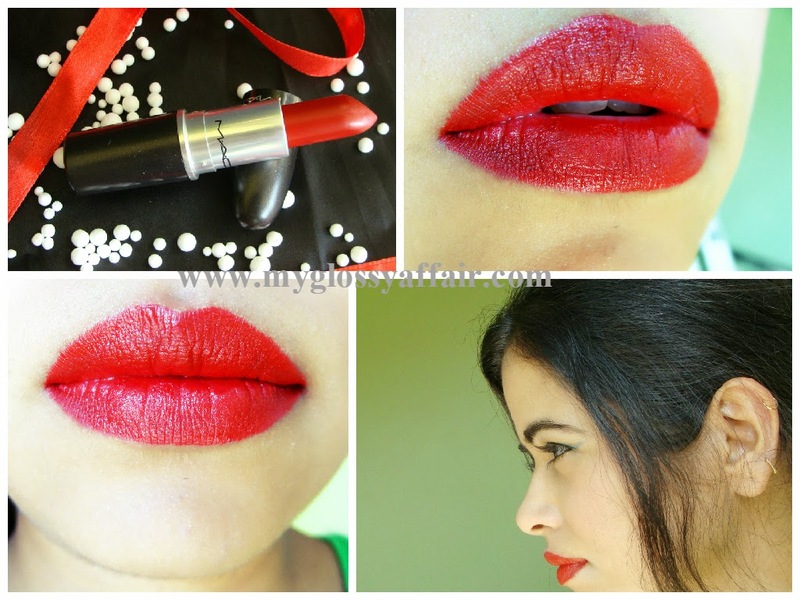 Previously I shared a lovely red lipstick by L’oreal, you can check the review here. This time I have come up with my all time favourite red lippie, MAC Russian Red. Its a perfect shade which will brighten any dull day and still wouldn’t look like overdone. Mac became famous through the colours, textures and formulas of its Lipsticks and to this day, it’s what brings new fans to MAC. From the signature matte finish specially created to work on the runway and in the studio to our famous Lipglass, our line has evolved to embrace an entire range of textures and formulas. Being a girl its pretty normal to get mesmerized by RED lippies, not always but definitely sometimes. MAC has many variants of red lipsticks but I think Russian Red is the one which suits every complexion, specially Indian tone. Those who don’t dare wearing red lippies, can go for this one without any second thought. This is a bold colour but isn’t that much bright, it will perfectly compliment all perfectly. It is a highly pigmented colour. You will get perfect stained lips with good pigmentation in a single swipe, but you may swipe 2-3 times to get that intense look. So wear it the way you like it, totally upto your mood. What I love most about MAC lipsticks, is the long staying power. It easily stays for about 7-8 hrs, surviving all drinks and meals. It does transfer onto objects but doesn’t look patchy even after that. It is neither too dry nor creamy, just perfect matt. I am so in love with this one that I have already finished 2 bullets of same shade and not just me but even my mom loves it. Its kinda family affair with russian red….hehehe. Once you try it, you will never replace it with any other red. Apply it with a lip liner, to make it stay much longer and for those fuller lips. I am wearing the same lipstick here too- Red Saree OOTD. You can also check a dupe of MAC Russian Red here. Suits all Indian skin tones well. Available easily at all MAC stores. NO CONS at all except that it is expensive. But, MAC offers great quality to compensate that ;). MAC Russian Red is a must buy and I highly recommend this one. I am so addicted to this and will surely repurchase one. Already on my 3rd bullet. Need I say more!! That red looks amazing on your lips! Beautiful shade. Glossy and suits your skin very well. I love the MAC lipsticks. Great post girl. I have Ruby Woo and Relentlessly Red but have yet to get my hands on this. This look brilliant on you! Great color, I have Ruby Woo but I think I might buy this one as well, it looks more moisturizing. the shade looks absolute gorgeous on u! I love red lips! That shade is absolutely stunning and looks great on. Wow that red is very pigmented more like cherry red than it look stunning on the images. Stunning color! Love the blue undertone! Wow.. it is such a brilliant red lipstick.. would love to flanuuut it !